The future is among us: „What Shall We Do Next? (Sequence #2)“ by Julien Prévieux as part of the exhibition „Subtle Patterns of Capital“ curated by Barnabás Bencsik in context of curated by_vienna: Tomorrow Today. Still from: Julien Prévieux, What Shall We Do Next? (Sequence # 2), 2014. HD Video, 16'47''. "What Shall We Do Next?" 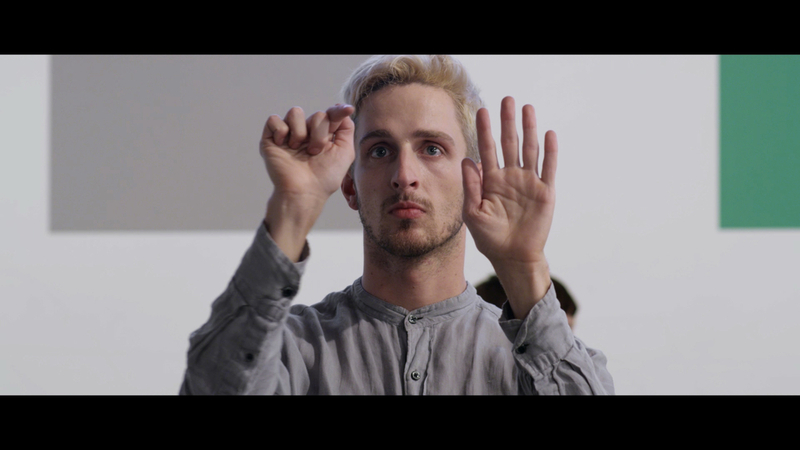 is a performance with six dancers composed by artist Julien Prévieux, as a result of his residency at Fahrenheit (Los Angeles), and in collaboration with choreographer Rebecca Bruno and musician Robert Barber. The performance originated from an ensemble of hand gestures that have been patented by several technology companies. When a new device is being invented and tested, a patent is registered in regards to its functions; but also to the gestures describing its use. Prévieux has been collecting these patents and specific gestures for over ten years. The patents that are being published currently can potentially be considered as instructions for future devices that will be used. Every new tool requires particular movements in order to be activated according to their patented descriptions that are available online. This performance conveys a reflection upon the evolution of recent technical gestures. To quote speculative fiction novelist William Gibson: “The future is already here — it’s just not very evenly distributed.” The reappropriation of these future movements together with the dancers invents a new context for their application and highlights that the future is among us, we just need to redistribute it. Watch „What Shall We Do Next? (Sequence #2)“ on Vimeo. Stills from: Julien Prévieux, What Shall We Do Next? (Sequence # 2), 2014. HD Video, 16'47''. Julien Prévieux (b. 1974) lives and works in Paris. His work has been exhibited in France (Musée d’Art Moderne de la Ville de Paris, Frac Basse-Normandie, 2012; Galerie Jousse Entreprise, Paris; Galerie Edouard Manet, Genneviliers), The Netherlands (Witte de With, Rotterdam), Austria (Kunsthalle Krems), Taiwan (Kaohsiung Museum), Los Angeles (Los Angeles Municipal Art Gallery) and at the 10th Istanbul Biennale, Turkey. The exhibition is part of curated by_vienna: Tomorrow Today, for which the philosopher Armen Avanessian has written an essay that questions the relation between art and capitalism. The text served as theoretical basis for all galleries and curators involved in the project.